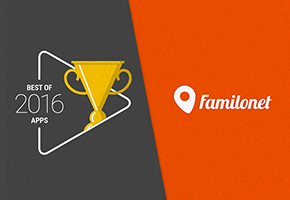 Hamburg / Stuttgart – The Hamburg-based startup Familonet receives the renowned award “Best of 2016” of Google in the category “The Best German Apps” in the Google Play Store. After the start of monetization this summer, this marks another milestone for Venista’s venture. The coveted award is given by Google in eight categories. Google rates the apps according to criteria as degree of innovation, usability, design and trends. Familonet receives this award in the category “Best German Apps” along with apps of the Frankfurter Allgemeine Zeitung and REWE. “Being awarded as one of the most innovative and user-friendly apps in the Google Play Store is a great honor for us. We are proud to make a major contribution to the startup scene in Hamburg with this”, says Hauke Windmüller, Co-founder and CEO of Familonet. The app Familonet allows family members to share their location or send messages and photos to other family members at any time. The fee-based premium version also features the possibility to send alarm calls to family members. The smartphone app, developed since 2013 as a family tracking app, is available in 20 countries and 16 languages by now. Throughout the globe, 1,7 Mn. people use the smartphone solution from Hamburg. The preservation of privacy is a top priority for Familonet. Each member can choose between three location modes. They allow him to share his location permanently, only check in and out of defined places or skip the location determination and stay in contact with other group members via chat. Founded in 2012 by Hauke Windmüller, Michael Asshauer and David Nellessen, Familonet helps to improve communication and safety of small social networks. It allows friends and families to update each other.